Made of 100% polyester exclusive of decoration. Movable eye mask w/ attached headband. How many chances do you get to dress to the nines every year? There are not many times in all of our lives when we get to make a dramatic grand entrance. Which is unfortunate, because grand entrances are just so much fun. The percentage of people who make a grand entrance on a grand staircase has gone down by 90 percent over the last hundred years. Let's not even think about the percentage of masked balls that have fallen out of rotation since the 1800's. It's just too sad. Why are we bringing up all these sad statistics? To inspire you, dear friend. When you have a chance to dress to the nines, to make that grand entrance, you've got to grab it. If you're going to a masked event, go with the most elegance you can muster. 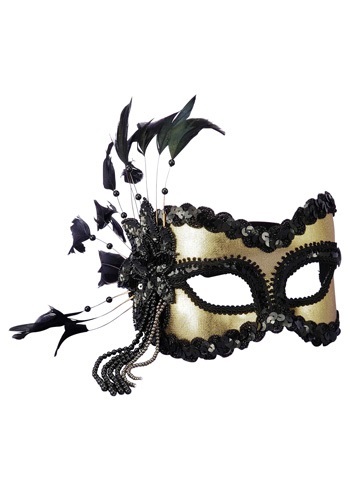 Our black and gold Mardi Gras mask has all the elements that you could ask for. It's dramatic asymmetrical feather and beading give the wearer a mysterious edge. The sequined edging catches the light and adds sparkle to your ensemble. We think you're ready to keep the grand entrance dream alive. Now, go find that grand staircase and make it happen.